I recently went through the code that handles ATTACK.OUT battle event conditionals and made a reference for all of the conditional commands contained therein... and there were quite a few more than I've seen documented anywhere, and some were a bit different than how they'd been described before. Some of these are well known and others less so! I added a table to the Wiki page here for the ATTACK.OUT conditionals since the table didn't seem to fit very well as a post. PSX FFT Hacking / (ASM) Start button skips events, effects, battle and event text, etc. Assembly language (ASM) refers to program code that a computer processor can "understand" and interpret as commands to follow out. Encoded assembly language is sometimes called machine code. Different computer architectures have different assembly languages. Computers don't understand anything but assembly language. So how can you code in other languages like C, C++, VB, etc.? Those code files have to be compiled into an executable file that the computer can understand. Ever wondered was was inside an EXE file? It's ASM. So basically, ASM controls everything every computer ever does. No big deal! The PSX processor is built on the MIPS architecture, so MIPS assembly language is the one we're looking at. Specifically, the instruction set the PSX processor (MIPS R3000A) can understand. Processors operate on registers, which are small areas of memory inside the processor itself that can be manipulated quickly. The PSX has 32 registers available for general use by the processor (and a few others used behind the scenes). 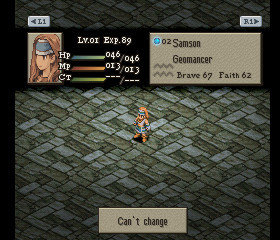 Setting the base class of the first enemy in the battle to Ramza's base class. Pretty bizarre, really. Let's look at a formula, why don't we? These values are what we'll manipulate in the formulas. So that's the technical idea of what's happening. But what significance does it have? This is a very common pattern to load in a value from a memory address to a register. The first command loads the upper half of the memory address into a register, then a value is loaded in at that location + the lower half of the memory address as the offset. Note that r2's value is not ready until two commands after this one due to load delay. lw syntax looks like this: lw (destination_register), (offset)(source_register), where you're loading memory into the destination register at (value of source register) + (offset). What's the significance of loading this into r2? Here, r4 = Memory value at r2 + 0x002c. We know r2 is the target unit, so what is offset 0x2c for a unit? See the formula hacking page for the unit offsets. The first command is a way to set r2 = 0x80. Using a command of the pattern ori (destination_register),r0,(value) is a way to set (destination_register) = (value), since a bitwise OR operation on zero and a value results in the value. You could also use addi to do this (0 + value = value). The second command says to save r2 to the memory location at r3 + 0x25. Why might we do that? jr is a command that will jump to the address in a register; r31 is the return address. This is a return statement, where we return to the code that called this formula... but yet, we have a statement under it that needs to be run. This is because jump/branch statements are subject to branch delay, which means that the statement after them is run before the jump truly occurs. sh is like sb, the only difference being that we save out a 2 byte value instead of a 1 byte value. The comments here are more minimal, but it's a lot easier to understand what's going on here. Note we just specified the file, offset, and changed code. This is certainly not overpowered at all. Next time we'll fiddle with formulas some more. This is my miscellaneous ASM thread, for assorted ASM hacks I've done that don't have a thread, or are scattered throughout miscellaneous threads. Basically I'm starting this thread at Pride's suggestion, as sometimes I'll write some ASM in some other section and it will get buried somewhere in a thread that's hard to find. Also, so I have a place to post some things I've done that don't fit anywhere else. MassHexASM - For encoding ASM commands into PSX-ready binary commands (with the little-endian option), or decoding them from binary commands to ASM instructions. This way you don't have to manually switch byte order like you did with Renegade64. Ideally, the output can just be pasted into a patch file. UWEntries - Change which base jobs use which UNIT.BIN and WLDFACE.BIN entries. For changing special characters, not generics. 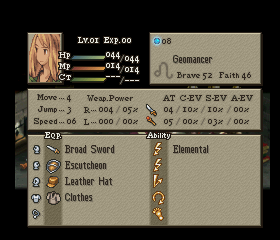 Gear Level bugfix - Fixes a bug in FFT where the random gear routine could select extremely low level equipment in certain situations (e.g. Linen Robe in Chapter 4). This is the standard gear level patch (based on shop availability) with an FFTPatcher override. My latest version. Gear level based on Shop Availability (Story Progression) - Picks random equipment based on what's currently in the shops instead of the levels of the units. Allows enemy levels to scale with you without their equipment scaling. Affects HP Damage, MP Damage, HP Healing, and MP Healing. case the Ability and Weapon elements will be combined. Optional: You can specify a multiplier to be applied to damage and/or a separate multiplier for healing. The format for the multipliers is 16.16 fixed point (e.g. 1.25 = 00014000). A multiplier of zero (default) will be ignored. This version has a variable flag to decide whether to use PA or MA. In the item data, this patch interprets Unknown 1 as Physical damage reduction (percentage) and Unknown 2 as Magical damage reduction (percentage). The damage reduction percentage for each piece of equipment is added to determine the total damage reduction. An ability's classification as physical or magical is determined by the 'Physical Attack' and 'Magical Attack' AI flags for the ability. (the sum of the two)! This hack's for learning from crystals where the enemy base job is different from yours. For example, Night Sword from Gafgarion. You'll need to put the ability to learn in the same slot as the skillset you're learning into. Since this one did appear in another thread, there's more info on it here. Excessive HP/MP recovery is not displayed. This allows you to use negative numbers for Y values in formulas. Any Y > 127 is considered as the negative number Y - 256 (e.g. 253 becomes -3). The source for this one is just changing lbu to lb where this particular address (0x801938fa) is read. Might be useful as an enemy-only ability for bosses, to use MP-heavy abilities without depleting their MP. Version 2 of the mana burn hack, which caps damage at MA * Y. Damages MP and deals equivalent HP damage. This makes formulas , [3e], and  subject to elemental cancel. Useful if you don't want bosses to be affected. The graphic width for the Reraise status text is slightly too short; this patch fixes that. This one uses a curve where CT is affected more at lower speeds, and the effect depends on the CT factor you choose (default 5). With CT Factor = 5, it begins taking effect at Speed = 5 and ability CT halves by Speed = 10, and would quarter by Speed = 20. Basically, for any ability, the CT is affected by a multiplier where ((CT Multiplier) = (CT Factor) / Speed). This patch disables paging up or down while the confirm menu is up on the ability learn screen. As a result, there is no way to do the JP scroll glitch. 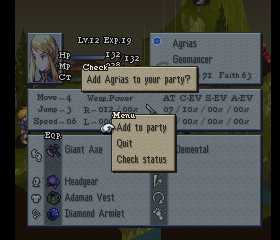 Removing a unit from the party no longer leaves a gap in the party! Speeds up text crawls significantly. Text delays longer than a certain amount are changed to that amount. Default is 2. Lower is faster. Switch unit number with L1 and R1 buttons in the formation screen. Changes unit order as appropriate. 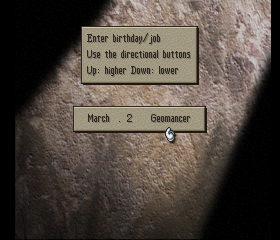 L1 and R1 still work normally (switching the selected unit) in menus. Press a button combination (default L1 + Select) to win the current battle. It needs to be done while the game is processing the battle event conditionals, so between turns, or between a unit moving and acting, or somesuch. Works even in Bethla Sluice. Doesn't try to load a unit from the party from the ENTD (Load Formation flag set) if they're not in the party, and instead uses whatever data is in the ENTD for that unit. You won't normally encounter this scenario, but if it were to happen in the normal game, it would create a messed up unit that would overwrite Ramza when the battle/event was over. Break out of multi-battle sequences by pressing a button combination directly after exiting the formation screen. Default is L1 + R1. Includes the "Load Formation ignored if unit not in party" patch, because that situation can occur if breaking out of a sequence where a Guest has already left the party. Fixes the equipment duplication glitches that can be triggered from using Best Fit in the shops. Fixes leveling down to subtract raw stats based on old level instead of new level, so it should subtract the same amount gained in the previous level. Also fixes level up abilities so that they add the same amount as leveling up via experience gain. Crit XA bonus minimum is 1 instead of 0. Maximum is still XA - 1. Always get a critical hit. Can be useful if you're testing crits or somesuch. So a while back I wanted to be able to use jobs 3A and 3B for some characters, and not have to go through the process of using another character's job like Simon's, replacing 3A with Simon, replacing Simon with my character, making the ENTD edits, etc. Much easier if I can just use jobs 3A and 3B, and point them to unused entries in unit.bin and wldface.bin (Like 08 or 09). In the help section I whipped up this patch, which is a quick and dirty way to get exactly that (Job 3A uses 08, Job 3B uses 09). Jobs [3A,3B] use unit/wldface [08,09] for formation screen and battle preparation sprites. But then we figured it'd be useful to be able to change these entries for any job. So we discussed making a spreadsheet for it. Raven was going to write one, but then it seems I pre-empted him. This spreadsheet should allow you to change which entries in unit.bin and wldface.bin are used for each base job. 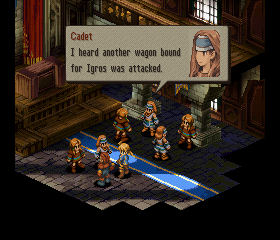 So, if you want to make Gafgarion's guest job (0x17) look like Reis in the formation screen, job wheel, battle prepation screens, etc? Just change the his entry from 0D to 07. Want to overwrite unused entries in unit.bin/wldface.bin and tie them to specific base jobs? Sure. Attached is the spreadsheet. Basically you just edit the yellow column, then copy the XML from the XML tab into a .XML file in the same directory as FFTorgASM and use it to apply the patch. I labelled the base jobs in the spreadsheet with what they're used for in the game currently, but interestingly, I couldn't figure out what jobs 0x35 - 0x39 are actually used for, if anything. Are those all unused? That might open up some possibilites for adding more characters without having to take jobs that are in use. EDIT (8/28/2018): Attaching new version of the spreadsheet! Fixes a problem with default values, notably for Holy Dragon Reis. 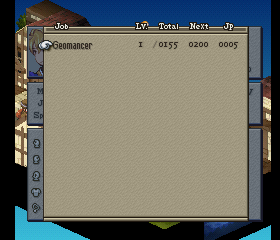 There are a lot of program files in FFT. Why is anyone's guess, but for a long time I've thought it would be really useful to be able to scan various files for program code (ASM). The problem is, the MIPS disassemblers you find online assume big endian byte ordering. Enter LEDecoder, my newest program, that will decode files with a little endian option. You just select the input/output files and have it do its thing. This'll let us find the ASM in any FFT file. The output is very similar to what you'd see in the disassembly portion of the pSX debugger. LEDecoder basically means 'little endian decoder', but of course, I couldn't call it LEDecoder without including an LED. A software LED, perhaps. ...Well, okay, maybe it's just a filled in circle. But anyway, it indicates the status of the program by its color. Most of the time it'll go orange and then green quite quickly when it's told to process. It's fine to run another decode as long as the LED isn't orange. So, what would be an interesting target file to run the decoder on? Say... perhaps an effect (animation) file? ...Yup, they've got ASM in them. Might explain why some work one way and others work another regardless of the graphics/palette/what have you! EDIT: Version 2 added to fix some problems with the decoder... It didn't recognize srav, jalr, or break. This uses the MassHexASM decoder, so anytime I update that, I have to update this, basically. New version is attached. * Used a save file dialog for the output file, so now you should be able to just type in output filenames. EDIT 1/11/2017: LEDecoder has now been rolled into MassHexASM. The newest version is available in that thread. After being frustrated with manually switching ASM byte order, I've decided to write MassHexASM, a program that lets you encode directly to little endian, and furthermore, should be able to encode ASM in a format where you just copy/paste the output to an XML patch (or what have you). This program was written in C#/.NET, so you'll need some version of the .NET framework to get this to run. I believe it should work with .NET version 2.0 or later. Other than that, should be all good. Let me know if you find bugs and I'll do what I can to fix 'em. Note on using the program: If you define a label, you need to put a colon ( : ) after it. If there is a command on the same line, separate it from the label by at least one space. * The little endian format uses the correct byte order: B4,B3,B2,B1. It also outputs the hex directly instead of trying to format for Gameshark. * My program encodes BEQ and BNE instructions properly. Renegade64 switches the order of the registers for some reason, which it can get away with because they're just used for an equality check, but it is still weird. * Encoding and decoding in the same form with little endian format. In testing, I've looked in the various XML files used by FFTorgASM, pasted patches straight into my program, entered a starting address, specified little endian and decoded it. Useful if you've got encoded hex but can't remember what the ASM is. * You can pad the output with spaces if you want to preserve formatting when pasting into an FFTorgASM patch. * Registers can use the $[num] format. (e.g. $4 instead of r4). You can still use names like $s0, $t2, etc. * You can specify negatives as offsets in save/load instructions (i.e. -0x7fad, as the screenshot shows). The negative sign has to be before the 0x, not after. * Encodes statements without regard to whether or not they make sense. This means Renegade64 will stop you in certain cases where my program won't, primarily when BEQ/BNE addresses are invalid. * LEDecoder has been added to MassHexASM, accessed via a menu item (Form -> LEDecoder), and LEDecoder is no longer a standalone program. * MassHexASM now checks the ASM upon encoding or decoding and displays warnings for various possible hazards, listed below. * Note that %hi(address) will be one higher than first 16 bits when the low 16 bit value is negative. * e.g. %hi(0x8018f5f0) = 0x8019; %lo(0x8018f5f0) = -0x0a10 (0xf5f0). * This means that the %hi,%lo combination works well with load and store commands, and also with the (lui, addiu) pattern, but not with the (lui, ori) pattern. * Fixed some issues with the load and store psuedoinstructions when using values between 0x8000 and 0x10000. * Modified the error checking functionality to report more errors, particularly when an undefined label is referenced. * Now recognizes GTE and COP0 register names as used by pSX's disassembly. * Added beqz (branch if equal to zero) and bnez (branch if not equal to zero) psuedoinstructions. * Fixed potential issues with byte order that could have occurred if running on a big endian machine. * Added "replaceLabels" optional attribute to the <Location> tag in XML patches, which, if set to "true", will replace any labels found in the hex with the correct hex address. The idea here is basically to be able to create dispatch tables using a list of labels if so desired. * The "li" pseudoinstruction now accepts negative values correctly. * Changed the window anchoring so that resizing the window causes the ASM and/or Hex textboxes to expand. Expanding the window to the right now causes the ASM textbox to expand (as well as the messages window); expanding downward causes both ASM and Hex to expand. * Any label starting with the '@' character is now a "persistent label" that will stay around even if not defined in the current code block. * Decoding no longer requires newlines; you should just be able to paste straight from a hex editor and it will decode every 4 bytes (8 hex digits) as a command. * Fixed some bugs relating to labels that contained a command on the same line. * The encode/decode textboxes are no longer limited to 32767 characters. * Both textboxes are now using a fixed-size font (Courier New) at a bigger size. Widened the ASM textbox to accommodate the bigger font. * Error reporting (in the "Messages" area) should now report more errors and be more specific. You should at least get a warning if it skips a line entirely (e.g. an unrecognized command when encoding). Decoding will also report unknown commands. * Can now specify starting address. * "Mode" dropdown added to select between PSX/PSP modes (as well as a generic Base mode). This will primarily affect coprocessor 2 instructions (GTE, VFPU) which differ between the two. This won't restrict the instruction set completely to ones supported by the CPU. * Added support for many new MIPS instructions up to the MIPS32R2 instruction set. * PSX mode should contain GTE instructions. Format is slightly different from psxfin's disassembly. GTE registers (both data and control registers) can be referred to simply using the generic format $(num), which works with all register types. * Coprocessor 0 registers can also be referred to using $(num). * PSP mode should contain the VFPU commands as well as other PSP-specific commands (bitrev, max, min, etc). * With the new instructions recognized, there should be no more unknowns in PSX/PSP code! * MassHexASM and LEDecoder now both use the same encoding/decoding engine (as well as FFTorgASM, upon release of the next FFTP version). * You should be able to specify addresses >= 0x10000000 (either with the starting address textbox, or a .org statement). * Encoding/decoding uses an entirely new process and should be significantly faster (In my testing, a decoding of the PSP's EBOOT.BIN going from about 10s to < 3s on LEDecoder). You'll probably only notice the speed if encoding/decoding a LOT (thousands) of commands at once. * Decoding a line can produce "illegal" if the decoder found the instruction and determined that the inputs are illegal/impossible (typically this can only happen with ins/ext instructions). An unrecognized encoding is still "unknown". If the program hits an unexpected error trying to decode a line, it can produce "error", but this shouldn't happen if the program is working properly. * You can use ';' to denote comments, just like '#'. * Syscall and break should now properly use 20-bit immediates. * Decoding is less lenient; invalid code will produce more unknowns. * Fixed a bug where load/store instructions with negative offsets were encoded with incorrect hex (and were treated incorrectly as pseudoinstructions). * Fixed a bug where newlines in the assembly section were erroneously removed when encoding. * Added a "name registers" option that uses register names like r2 = v0, r4 = a0, r29 = sp, r31 = ra, etc, when decoding. * MassHexASM can now support many psuedoinstructons even if they take multiple lines. The list of psuedoinstructions here should mostly be supported. You can also do fun things like lw r2,0x80192d90 and lbu r3,0x801908cc(r4), although these commands always generate the entire address, so this will be less efficient in cases where you can reuse part of the address. Those two statements would become 5 lines of regular ASM, but this example can be done in 4. As a sidenote, these pseudoinstruction patterns are very apparent in FFT's ASM code. * Added a "Show Addresses" option which will show the appropriate addresses on encode/decode in the left textbox. * Added support for 'select all' using ctrl+A. * Little Endian is now the default byte order. * Added support for srav, jalr, break (10-bit immediate), syscall (10-bit immediate) and trap (26-bit immediate) commands. * Fixed a bug where label addresses could be calculated incorrectly when the input contained instructions on the same lines as labels, resulting in incorrect hex for branch/jump instructions. * Fixed a bug where an instruction on the same line as a label could be parsed incorrectly. * Fixed a bug with encoding long immediates (such as in the j command) when all eight hex digits were not specified. * Fixed a bug where the program failed to encode certain I-type instructions (bgez,blez,bgtz,bltz,bgezal,bltzal). * Fixed a bug where the program could incorrectly decode certain I-type instructions (bgez,blez,bgtz,bltz,bgezal,bltzal). * Added support for mthi/mtlo instructions. * Fixed a bug where labels would only be recognized if they were from earlier points in the code. * Fixed a bug involving placement of tab characters that could cause the program not to recognize lines of code. * Added support for nor/not instructions. * Can now decode to negative offsets in the appropriate cases for addi and similar instructions. EDIT: I'm putting the Gear Level ASM patches here for convenience. Also, I'm attaching them as an XML at the bottom of this post. Recently I've been thinking about an idea for enemy unit levels scaling with the party and how that affects random equipment. By default, that means enemy gear will scale up with the player's level, meaning that after a certain point, the player is going to be outmatched by equipment he can't obtain except through stealing. On the other side of the coin, if the player manages to level very little and/or use degenerators, he can keep the shop equipment ahead of the enemy equipment and gain an advantage that way. My objective: fix the gear of enemies at a certain tier, depending on the battle... without fixing the equipment itself. Loading the current unit's level into a register (r14)! r14 is then used for a check in the loop, so this is the number being used to determine the quality of enemy equipment. 0x001251cc: bne r2,r0,0x00125238 ...skip adding it to the shop item list for purchase. But, well, we loaded r8's value (the player's number) from the stack somewhere, it looks like. How did it get there? r2 changed to the correct value (0x0d) after the call to subroutine 0x0ef1a8. At least under some circumstances, this subroutine at 0x0ef1a8 seems to load r2 with the variable I wanted... but unfortunately, we're in a shop, so probably we're in WORLD.BIN. When I tried to call this subroutine in a battle, the memory at 0x0ef1a8 looked completely different... the subroutine wasn't even loaded into memory anymore! (Leading to fantastic results). Besides, I wasn't sure of the circumstances under which that subroutine would return the storyline variable (it uses a billion registers and is also recursive, so it's a barrel of fun to try to trace through). So my next thought... forgetting subroutine 0x0ef1a8... was I overcomplicating things? We already have an offset to the current unit in subroutine 0x05cc98 (where the random equipment is loaded). So what other offsets can I use? Is there some other property of the current unit I can use to check for what the equipment quality should be? Looking at the formula hacking reference, there's basically nothing. I can't use HP, MP, Brave, Faith, etc. So what to do? Venture into the unknown. In the ENTD in FFTPatcher, there are unknown fields for each unit, in that little box down in the bottom left. Some of them seem to be AI flags, but what of the one down in the very bottom left (last row, leftmost)? I couldn't find a single instance of it being anything other than zero (though I only checked the story battles). So if it's unused... why not use it? This number could function as a "give the enemy gear as if his level was X" variable, without actually changing the unit's level. I located it in RAM at unit offset 0x0169. We could simply change the offset checked by subroutine 0x05cc98 to use 0x0169 instead of 0x0022 (level). While that's viable, we'd have to make sure we changed every single instance of this variable in the ENTD. What I really want is for it use 0x0169 unless it's zero, and otherwise use 0x0022. 0x0005cca4: 0c062859 jal 0x0018a164	Call my subroutine! And we've done it! Random enemy equipment would now load based on the "gear level" you give them at unit offset 0x0169, analogous to what their gear would be if they were at that level... without changing the actual level. Thus, the level can scale with the party, but the gear can remain fixed at a certain tier. Honestly, the simplest answer to (1) may be to just go with the first approach, just straight changing the instruction at 0x05cd2c to load offset 0x0169 instead of 0x0022, beause that would be a one-line ASM hack, and it would work... it's just that you'd have to change that 0x0169 number in the ENTD for every single unit that loads random equipment, or they'd have none at all (I presume). It's just that I'd prefer the (Use 0x0169 if it's there, otherwise the level) approach, but am not sure where I could put the subroutine that does that. Thoughts? Concerns? Ideas on other ways to make this happen? Different offsets to use? Random comments?